I couldn’t figure out why my Junk Email filter on Outlook appeared to kick the bucket when I reset my laptop a couple of months ago – then this morning, out of the corner of my eye, I spotted something go in the junk mail folder and then get pulled out. 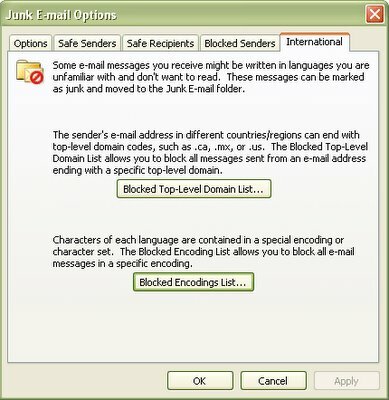 It appears that all this time my message rules have been working against me and pulling junk mail back out of the junk folder and into my other folders. Hmph. I’d love to know who suggested this feature – because we all know the best way to deal with things we’re unfamiliar with is to discard them and pretend they don’t exist. Thankfully this feature isn’t enabled by default. Personally, I don’t get any SPAM in a language other than English (although English is a loose description for what some of them are written in) – so generally if I get an email in something other than English it’s likely that the sender actually bothered to email me. At the very least I’ll run it through some freebie Machine Translator to see what pops out, or maybe run it by someone who might understand it. I shudder to think how many inboxes are checked to only receive English emails. The tab should really be labeled “Uninternational”. Previous Previous post: Happy Holidays & I’m off for a couple weeks. Next Next post: Office québécois de la langue française – a primer of sorts.